I was all set today to complain about my pet peeves, which are unresponsive, insensitive, and incompetent bureaucrats and corporations; and unresponsive, overly complicated, and generally lousy technology. 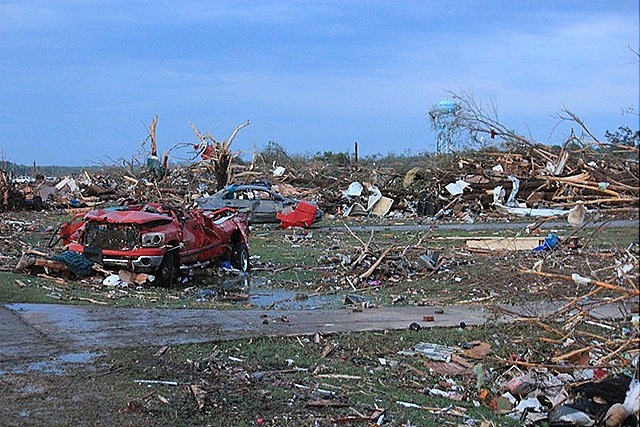 But then tornadoes blew through and devastated the little towns of Smithville and Wren, MS, as well as Tuscaloosa and Birmingham, AL and gave me some perspective on my trivial concerns. A number of the members of my congregation in Amory, MS live or work in or have ties to Smithville and Wren. As I talked with them yesterday or read their Facebook posts, I felt humbled by their sacrifice and courage and ashamed of my complaining. There was Ricky, who was working in the Post Office when it was flattened; he survived (without a scratch) by clinging to a pipe. Or Truitt, who with a Department of Transportation crew helping, worked six hours just to clear 200 yards of debris from the road. Or Molly, whose aunt and uncle lost everything when the storm blew their home apart. Debbie, whose car was destroyed. Tom, who posted pictures and a story of sorrow of his now 60%-destroyed hometown as an iReporter for CNN . Warren and Don, two minister friends who were working mortuary duty at the Monroe County Chamber of Commerce and with sadness reported to me that 38* had been killed in a town of less than 1000. How dare I complain about anything when there are those who have no home, no clothing but what’s on their backs, no transportation of their own, no cherished pictures, no anything, who now must depend on others for everything they need? How can I grieve my little losses when so many across the South have had their loved ones taken from them? Of course, knowing me, this attitude won’t last, sinful and flawed man that I am. But maybe for a little while, my life will be different and better from having reflected on what really matters. *Please note that I likely misunderstood this figure. As of 5:17 PM on April 29, the confirmed death toll from a reliable source was 14. On a Sunday earlier in this Lent, I decided to eat lunch at a Mexican restaurant that had recently reopened in Amory under a new name, “El Rey.” It was about 12:45 PM, and the wait line was long. After finally being seated, I started munching on my chips and looking over the menu. My server came in a bit, and I ordered the taquitos. Usually the meal is on the table in any Mexican restaurant in no time, but today was different. I waited and waited, and still no food. Finally the manager came over and explained that the place was so busy the kitchen was having trouble keeping up. I told him I was in no hurry. By the time the meal came, I had made my to-do list for the week on the little pocket pad I always keep with me. The taquitos with the usual sides were delicious, and I was stuffed. But no sooner had I finished than the manager appeared again with a banana chimichanga and ice cream. It was on la casa, an apology for my having to wait. What an incredibly gracious thing to do, I thought (and of course, it was also good business). But then I got the real surprise. When I had finished the dessert, my server came over and said in her halting English “Someone pay for you.” I was floored. I was fully prepared to pay and truly had not minded the wait. Yet “someone pay” for me. On Good Friday, as the Heidelberg Catechism reminds us, “someone pay for you” and me. And in this case too, it was El Rey, the King, Jesus the Messiah from the line of David. “… have you not read in the law that on the sabbath the priests in the temple break the sabbath and yet are guiltless? I tell you, something greater than the temple is here. But if you had known what this means, ‘I desire mercy and not sacrifice,’ you would not have condemned the guiltless. For the Son of Man is lord of the sabbath.” He left that place and entered their synagogue; a man was there with a withered hand, and they asked him, “Is it lawful to cure on the sabbath?” so that they might accuse him. He said to them, “Suppose one of you has only one sheep and it falls into a pit on the sabbath; will you not lay hold of it and lift it out? How much more valuable is a human being than a sheep! So it is lawful to do good on the sabbath.” Then he said to the man, “Stretch out your hand.” He stretched it out, and it was restored, as sound as the other (Matthew 12:5-13). Recently HLN ran a story about a widow who was fined $120 by her Homeowners’ Association for supposedly using her garage as a living space. She kept her garage door up during the day and invited neighbors to drop by to chat or play cards. The lady thus enjoyed companionship while modeling neighborliness and providing a community in these days when so many are isolated from and suspicious of others. She said she did not intend to pay the fine. I think the gospel is on her side, not that such a thing will matter to the rule- and aesthetics-obsessed board of her HOA. Regulations, ordinances, laws, and the like are necessary components of society. They keep chaos at bay and seek to ensure the safety of all. But mercy and community trump the rigid enforcement of rules in Jesus’ view. Human well-being is more important than who says so and what you can do when. The question comes down to what we value most. Looks? Conformity? Tradition? The status quo? Or is it human community? Wholeness? Laughter? Diversity? Healing? It’s always lawful to do good. Keep that garage door up, lady! My niece Page turns 20 today. Not the milestone that 18 or 21 is, but still significant. During her two decades, Page has never known a world without the Internet, cell phones, 24/7 TV, video games, and CDs, which in turn gave way to MP3 downloads. She swims in that ocean as naturally as fish do in theirs. Like the rest of her Millennial generation, Page’s first language is Digital, while her Boomer uncle still sometimes struggles to speak it, lapsing often into Analog. In her 20 years, this extraordinary young woman has also never heard “You’re a girl; you can’t do that.” Hers is a world where women are not limited in their options the way her grandmother may have been. So Page, I expect, will go on to realize her potential in ways no one in her family ever did. Page also has known increasing acceptance and celebration of diversity. And she has looked into the “riotous kaleidoscope,” as someone once called it, and liked what she saw. She sought out a college roomie from another country. She has gay friends, Asian friends, black friends, gay black friends. The names of her over 1200 Facebook friends bear witness to how broad her relationships are. What kind of world would we have if every child, youth, and young adult could say that? “I have other sheep that do not belong to this fold. I must bring them also, and they will listen to my voice. So there will be one flock, one shepherd” (John 10:16). The Other Life is but the latest work of fiction (though the author says not science fiction) to explore the idea of parallel universes. In the book, written by Ellen Meister, a woman is married and pregnant in one reality, while she is single in another. She goes back and forth between the two through a portal in her basement, if I recall correctly from the discussion on NPR. Alternate worlds and parallel realities have been a mainstay in sci-fi for quite a while. “Star Trek” used the device from the classic series through “DS9” to “Enterprise.” “Stargate SG-1” had a “quantum mirror” through which one moved between alternate worlds, an infinite number of them. And, my current favorite, “Fringe,” makes parallel worlds the central focus of the plot. So, in the show, in our world, 9/11 took out the Twin Towers, which still stand in the alternate version. John Kennedy and Martin Luther King, Jr. did not die by assassination in the other world. Indeed, one denomination of currency in the alternate reality is nicknamed a “Jr.” since it has MLK’s face on it. Ridiculous? Not really. Brian Greene, the renowned physicist, has written seriously about such parallel worlds, an idea that actually began to be talked about as early as 1957. He says that every decision we make creates a new universe. Every decision that is possible is realized, each in its own reality. Each possibility allowed by quantum mechanics does in fact happen. What, then, if there were a world in which there was no rebellion against God? Or suppose that Joseph had not been thrown in the pit by his brothers or Moses had not been rescued from the Nile? Consider what the world would have been like if the Greeks, not the Romans, had ruled at the time of Christ. What if Jesus did not die by execution, but lived to a ripe, old age and kept teaching? And on and on. Every decision we make is important, from which route we take to work to how we will respond to a critic to whether we take a risk and meet someone we have admired from afar. That may be frightening in some respects, to realize how much our choices matter. But in another way, it’s heartening to know that when we make a terrible mistake, there may in fact be another version of ourselves who chose rightly. And the ripples that stone of decision made did not set up a tsunami of negative consequences, but instead started justice rolling down like waters. For a conversation with Brian Greene, listen in at http://www.guardian.co.uk/science/blog/audio/2011/mar/21/science-weekly-podcast-brian-greene-tim-jackson.